Happy Birthday to all Leos! No, that's not me. I do not have a Leo Sun. However my Rising Sign, Moon and Venus were all in Leo at birth. If you are like me and have a strong Leo presence in your birth chart, you may pay heed to this description as well. Rising Sign Leo describes how people see me. Moon in Leo indicates how I react emotionally and Venus in Leo tells me how I behave in love and relationships. A bit of sunshine never hurt anyone and that's precisely the sort of warmth that Leos are known for, with their enthusiasm and exuberance, everyone wants to bask in the glow of the Leo's sun. I've placed this character in a desert landscape because it conveys heat and warmth. Leo is fondly placing her arm over her beloved camel, denoting Leo natives' capacity for demonstrative affection. The splendid red outfit works well to grab attention, something Leos don't mind at all. As for that fierce camel, it's an animal that suitably conveys the pride and dignity that the natives emanate in all they do. Meanwhile, camels also evoke endurance. There is a loyal streak in all well-treated camels, a loyal streak which is grossly undermined. 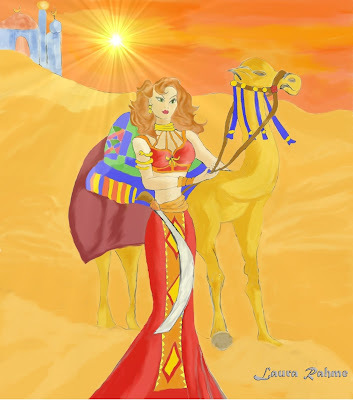 So overall, the camel is a strong symbol of the devoted Leo native and their enduring love. To add to the regal quality of this character I've made her a haughty queen. Her name is Queen Nadia. This strong lady is on a desert adventure and apart from her Fire sign comrade, daredevil Aries, no one quite matches her thirst for excitement and for the execution of grand projects. You will notice that Queen Nadia has a sword which only continues my obscene pattern of phallic symbols and doesn't really signify anything in terms of her astral representation except perhaps that you should never cross a Leo. She's a little bit arrogant in this photo, good for her. She's quite frankly telling you that if you don't measure up, she won't have time for you. Only the best will do for this lady thank you very much. Did you drew ths picture yourself ?.? Yes, I drew this when I was in my late teens but only just recently had the courage to color it.